Despite all of the talk about credit cards, debit cards and mobile payments, cash still dominates many forms of payments. In fact, any talk about a cashless society seems tremendously premature. 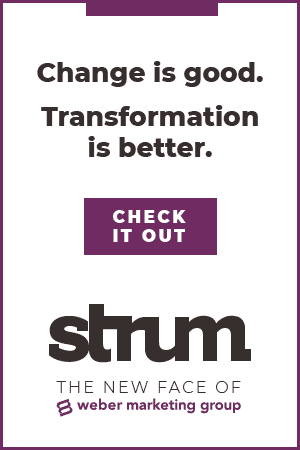 You can’t open a bank or credit union publication today without hearing about the transformation (and disruption) of the payments industry. New players are emerging, with established financial institutions trying to keep up with digital payment innovations. There are two main reasons that the much-hyped ‘cashless society’ has not arrived. First, cash continues to remain popular for use in small-dollar transactions by all segments of the population because of its convenience. Second, a rather significant segment of the population remains unbanked or underbanked, thus without access to the primary alternatives to cash. This creates an interesting paradox between the popularity of cash and the value of cash transactions. In the Fed study, the average American consumer had 59 transactions, including purchases and bill payments, with 23 of these 59 payments involving cash. The graph below shows that, at 40 percent, cash makes up the single largest share of consumer transaction activity, followed by debit cards at 25 percent, and credit cards at 17 percent. Electronic payments account for 7 percent, while checks make up 7 percent. All other payments represent less than 5 percent of monthly transaction activity. Interestingly, despite all of the hype around new forms of digital P2P transactions, text and mobile payments barely register at less than one half of one percent. 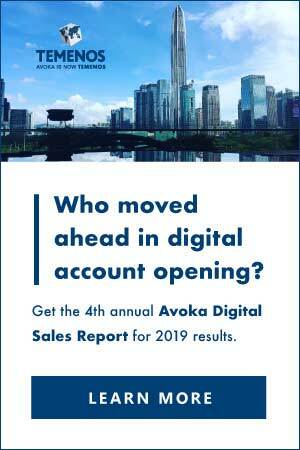 While the number of cash transactions is high, cash accounts for a relatively small share of total consumer transaction value at 14 percent, with electronic payments making up 27 percent and checks 19 percent. In fact, the average value of a cash transaction is only $21, compared with $168 for checks and $44 for debit cards. As shown below, consumers typically use cash for the large number of small value payments that occur each month. According to the study, about one-third of the average consumer’s monthly payments involve transactions with a “ticket size” less than $10 and two-thirds of these transactions are done with cash. 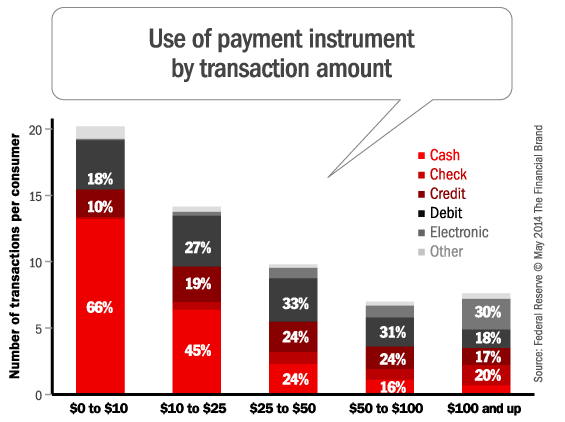 Similarly, consumers use cash for half of all of their transactions valued at less than $50. As can be seen, both the number of cash transactions and cash’s share of transactions fall as the payment value rises. Alternatively, the number of card payments remains roughly the same regardless of transaction amount. Once the size of payment rises above $100, the number and share of electronic payments and checks become significantly more prominent, in part due to the influence of bill payments. For the most part, the average ticket size for many of these expenditure categories is relatively low, in alignment with the first reason that cash remains a prominent transaction choice. Debit cards also tend to be used frequently for these expenditures, indicating that using cash for these transactions was not driven by a lack of other payment options. The research also found that consumers use cash similar to how they use debit and credit cards. The use of credit and debit cards by expenditure category is correlated to that of cash, with food and personal care items making up the largest share of consumers’ use of these instruments. 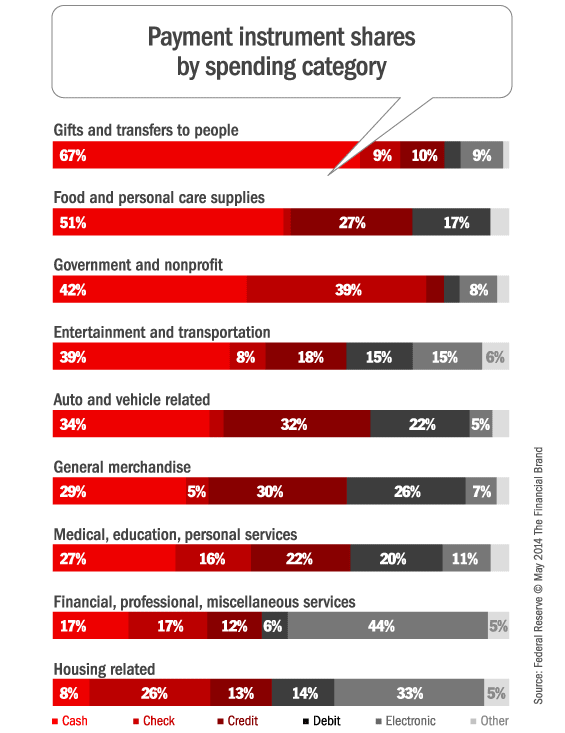 In contrast, consumers seldom use checks for these sorts of day-to-day expenditures. P2P transactions is one area where cash aligns more with check usage than cards, mostly because convenient usage of cards for P2P is not readily available (Square Cash, Google Wallet and PayPal for P2P are still not gaining significant traction). However, while cash is used for more the majority of P2P transactions, these transactions make up a relatively small share (6 percent) of all cash transactions. Cash is not the #1 payment choice by the majority of consumers, but it plays a significant role as the fallback payment instrument for most consumers. 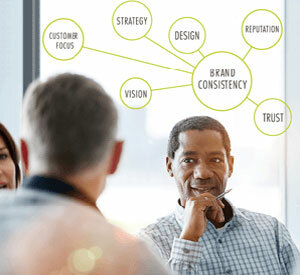 According to the research, 43 percent of consumers say that the debit card is their payment instrument of choice, while 30 percent of consumers say they prefer cash and 22 percent say credit cards. In all of these cases, the consumer actually uses their preferred choice more than half of the time. When asked about their backup payment option, however, most consumers who preferred a non-cash payment instrument declared cash as their second choice. Sixty percent of consumers who prefer the debit card, for example, picked cash as their second choice. A similar observation holds true for other payment instruments. Interestingly, debit and credit card customers do not prefer the alternative plastic option as their secondary choice. Possibly reflecting attitudes toward credit use after the financial crisis, consumers who prefer debit cards use the cash alternative 36 percent of the time, while only using credit cards for 7 percent of their transactions. Consumers of all age groups list cash as their preferred payment instrument, yet 18 – 24 year olds actually prefer cash at a higher percentage (40 percent) than any age group. 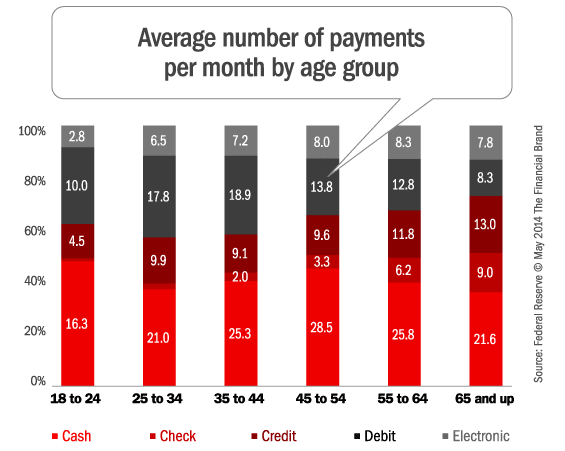 At the same time, this age group also has the highest preference for debit cards, potentially because they have limited incomes and therefore limited access to banking services. Alternatively, older consumers are more likely to prefer credit cards and checks than younger adults – and are less likely to prefer cash. This affinity to credit cards by seniors, relative to other age groups, is most likely attributable to income, wealth and the tenure of financial relationships. As shown below, virtually no consumers younger than 35 prefer checks, which the study attributes more to engrained habits than a true preference of checks as a convenience payment option. As with the trends found throughout the study, young adults use cash far more than any other option (based on number of transactions), while all age groups tend to use cash more than their stated preferences would indicate. 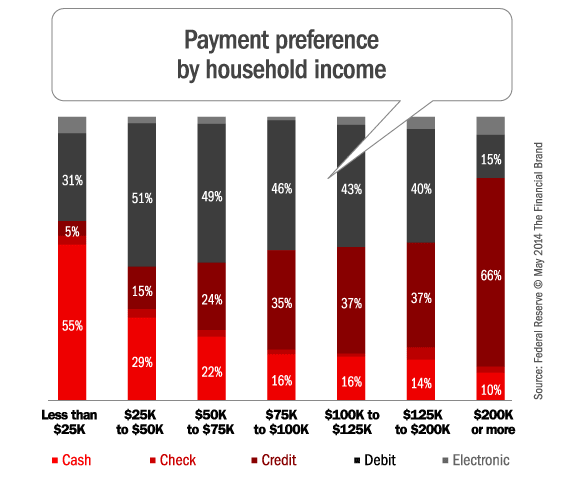 The study found that 55 percent of consumers with household incomes less than $25,000 per year prefer cash over non-cash payment instruments, while those households making more than $200,000 per year exhibit a very strong preference for credit cards. In fact, the preference for cash declines sharply once household income exceeds $25,000 per year, with debit cards cited as the preferred payment instrument for all those in household income groups between the two extremes. Interestingly, despite the declining preference for cash as income rises, all income groups use cash approximately the same number of times a month (22 times) regardless of income. The difference is that those making less than $25,000 annually use cash for a much wider variety of transactions, and for greater transaction amounts, than do those with higher household incomes. Consistent with this, the total value of low-income consumers’ cash spending, at $558 per month, is much higher than any other income group’s cash spending. Low income consumers also use cash for bill payments like housing more than the average consumer most likely due to a lack of access to mainstream banking services. One additional reason why cash is king that was not covered by the Fed study is that consumers are becoming wary of the safety of debit and credit cards. In a study by Balance Innovations, only 39 percent of consumers were ‘very confident’ in the safety of plastic as a payment option. While the issue of safety was more prominent with older consumers, 52 percent of younger consumers were either ‘somewhat confident’ or ‘not confident’ in credit/debit safety. Could this be an indicator that cash transactions are actually on the rise? According to the study conducted after the Target data breach, 32 percent reported they would be using cash as a method of payment more frequently. Most interesting, 46 percent of the younger shoppers that claimed to be the most confident in credit and debit cards plan to use cash more, the highest level of any other age group. Several studies provide evidence that cash continues to be a viable (if not preferred) payment option for all categories of consumers. While being the dominant payment option for the lowest value transactions, cash is also preferred for certain types of transactions and is the secondary choice for those that prefer cards or checks. Finally, low-income consumers will continue to be heavy cash users as long as mainstream banking alternatives are not available. And, while other digital payment alternatives continue to be promoted heavily, their impact on the marketplace to this point has been virtually non-existent. So, while the use of cash may be declining, we are far from a cashless society or one that will quickly embrace digital payments, especially for low ticket purchases. Until the financial community can provide an alternative that is as widely accepted, convenient and breach-proof as cash, dethroning cash as king will be difficult. This article was originally published on May 6, 2014 . All content © 2019 by The Financial Brand and may not be reproduced by any means without permission.